Their father John, born in 1868, was a twin and one of about ten children born to George Carrod (1828-1900) an agricultural labourer and his wife Hannah, nee Mitchell (1837-1887), at 8 Blacksmith Row, Horsemoor Green, Langley. Their mother Elizabeth, was born in Iver, c1868, the daughter of Edward Elliott, a labourer, and Joyce, a dressmaker. She had a sister and two brothers and in the 1881 census they were living in Colnbrook High Street. John and Elizabeth married in 1889 and moved in with Elizabeth’s family. They wasted no time starting a family of their own. The 1891 census shows them with a daughter Edith age 2, and Elizabeth Jane age nine months. (Edith does not appear on subsequent censuses.) Their son, Albert Edward, was born on 13 January 1895. After the death of Elizabeth’s father, the young couple moved with their growing family back to Blacksmith Row in Langley. (John’s twin brother William lived in the same street as did other members of the Carrod family.) 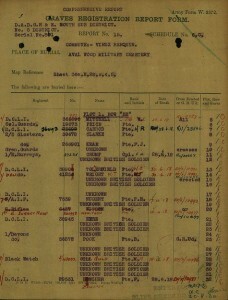 The 1901 census records them there with five children; Elizabeth Jane 11, John 10, Albert 6, James 3, and Henry Ralph 2, born 1899. Also with them, in just four rooms, was Elizabeth’s brother, Genty Elliott, a brickmaker. By 1911 the family had moved to Datchet. On the night of the census, it was just the boys, John, Albert, James and Henry Ralph, who were at home with their parents, as well as another brother, William age 9. They all shared five rooms at 3 Rose Cottage on New Road, Datchet Common. (This cottage no longer exists.) 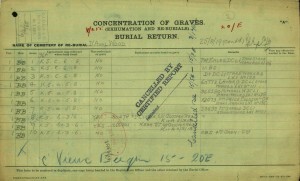 Henry Ralph’s occupation isn’t known, but his family were labourers and it’s likely that he was too. When war broke out, Henry Ralph, known as Harry, was just 15. His brothers, Albert, John and James all signed up, as did several of their cousins and one of their father’s brothers. Harry would have received his basic training in the 95th TR Battalion. (These Training Reserve Battalions were set up after conscription was introduced in 1916.) 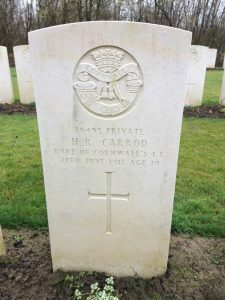 His records indicate that he was then posted, as Private 36493, to the 7th (Service) Battalion of the Duke of Cornwall’s Light Infantry (DCLI) and then to the 1st Battalion DCLI. The dates of these postings are not given. The 7th was on the Western Front from 1915 to 1918. The 1st was on the Western Front from 1914 until 1917, then was deployed to the Italian Front along the River Piave for six months from November 1917 to strengthen the Italian resistance after a disaster at the Battle of Caporetto. They returned to the Western Front in April 1918. Nineteen-year-old Harry was killed in action just a month later, when he was fighting with the 1st DCLI as part of the 5th Division, at The Battle of Hazebrouck (one of the battles of the Lys) and the Defence of Nieppe Forest. On 28 June, when Harry was killed, the 5th Division was engaged in the Action of La Becque. (For more details, see The Duke of Cornwalls Light Infantry, 1914-1919, by Everard Wyrall.) The Cornwalls had been ordered to take part east of Nieppe Forest. They made final preparations for the attack at La Lacque Camp and at 9.30pm on 27 June they moved to their assembly positions, some 200-300 yards east of the Arrewage-Caudescure Road. At 6am the following day, their artillery barrage fell on the enemy’s defences, just 200 yards in advance of the Cornwall’s front line. Shells rained over their heads and onto the German trenches. The attack took the enemy completely by surprise and the artillery barrage was able to advance by 100 yards in four minutes. The Cornwall’s Battalion Diary records: “when our troops left their trenches and advanced towards the enemy’s front line they met with little or no opposition and all objectives were taken without the slightest difficulty”. The Germans surrendered freely. Their casualties had been very heavy and it is said that in one place more than 35 men lay heaped together, all bayoneted. Altogether that day the 5th and 31st Divisions captured about 500 Germans, 50 machine guns, five trench mortars and three field guns. They also suffered many casualties themselves. The 5th reported 29 officers and 890 other ranks among their casualties. The Cornwalls lost about 40 per cent of their total strength, the majority being wounded. The whole of the objectives from Vieux Berquin to the River Bourre had been captured by the two Divisions, an advance of a mile in depth along a three-mile front. This was the first victorious operation of any size since the Somme and Lys Battles of March and April. It was also the first and last in which the 5th Division was engaged before the Advance to Victory began in August. There must have been considerable confusion about Harry’s fate. Three months after his death, the Windsor Express reported on 7 September 1918, that he was wounded and missing. Also the same month, Datchet Parish Magazine reported: “We are sorry to learn that Henry Carrod, who was reported as wounded on June 28th and was thought to be in one of our hospitals, is now again reported as wounded and missing.” His parents had already lost one son, Albert Edward, who had died on 22 August 1917. Harry had now fallen and two more sons were still at the front. Harry was posthumously awarded the British War and Victory Medals. 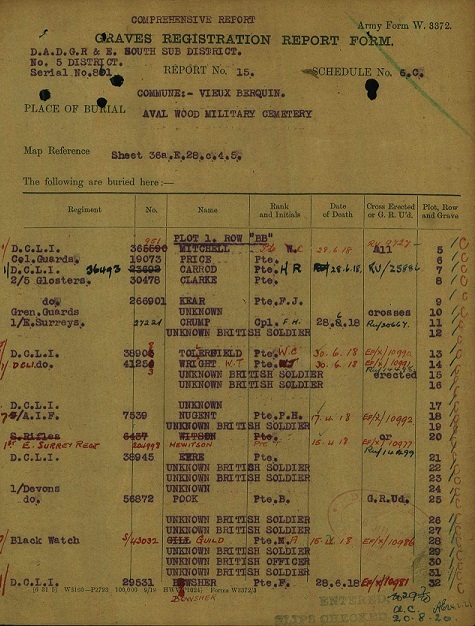 Although full military records don’t appear to exist for Harry or his brother Albert Edward, there is some information about their brothers. When John enlisted in September 1914 at the age of 22, he asked to join the Household Cavalry. He was posted initially to the 2nd Life Guards and later transferred to the Guards Machine Gun Regiment, serving initially in Britain and then in France from May 1915. His records describe him as nearly 6’ tall with a fresh complexion, grey eyes and dark brown hair. 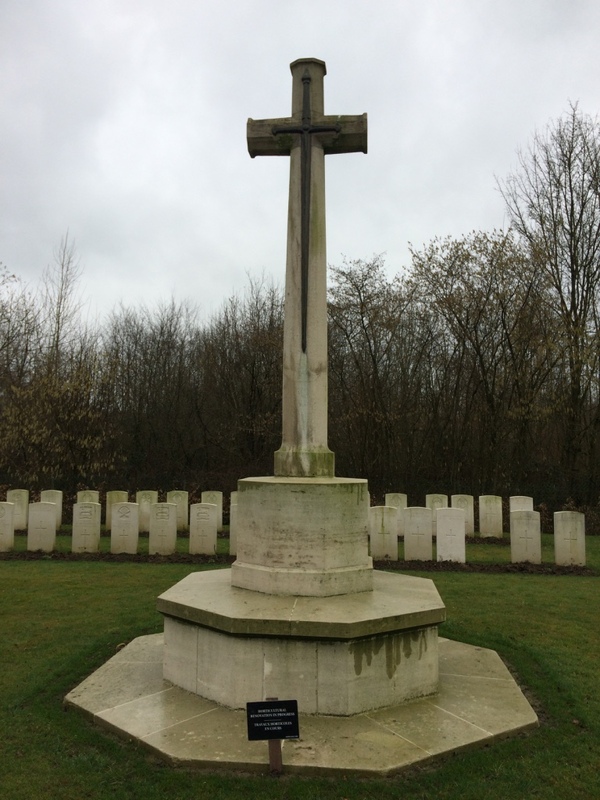 Their other brother, James, who also survived, was in the 5th Battalion of the Oxfordshire & Buckinghamshire Light Infantry, as was Henry Pickton who is also remembered on Datchet’s memorial. Thank you to the Datchet Village Society for providing this information about my Great Great Uncles Harry and Albert Carrod. So sad to learn of their fate. How very proud we are of them and they will never be forgotten.